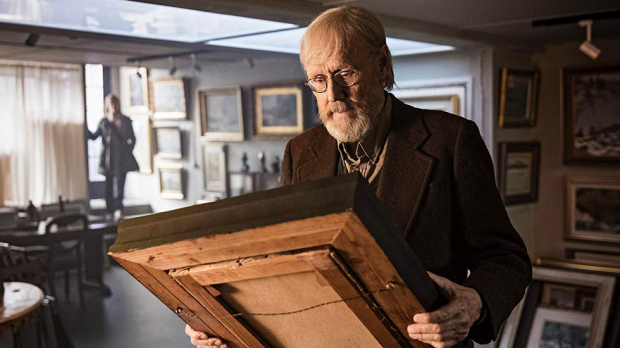 Dealing with some of the existential qualms of the septuagenarian kind, this film about the art world and its relation to commerce through the auctioneering world is a well intended story, though more story would’ve greatly benefited this plodding film. Olavi (Heikki Nousiainen) is an avid collector of art, though a humble one who wouldn’t spend a great deal for any auctioned painting to present in his small and modest showroom. The deal of a life-time comes by when he notices an otherwise nondescript little painting that he suspects is an uncredited and unrecognised piece by a famous painter worth far more than what he could pay for at its auction. Although he’s not much of a family man, his grandson Otto (Amos Brotherus) is dropped into his life to help with the store, just at the right moment when he can also help with investigating this mysterious painting. These investigative moments between Olavi and Otto lure the audience into this quest for not just a financially rewarding deal, but to bring life and authentication to a great artist’s unrecognised works. As engaging as this core concept is, it’s surrounded by stock tropes of this elderly protagonist, such as his familial estrangement, his reconnection via his grandson, and how this affects his ensuing will. It seems One Last Deal would be better off including more back-and-forths between Olavi and the auctioneer as he begins to suspect he’s allowed himself to be ripped off. One Last Deal’s story shortcomings are somewhat made up for by the technical craftsmanship on display. It has an eye for gorgeous and evocative colour palettes, kind of similar to the art-works themselves seen within this film, that’s present in some of the carefully assembled cinematography which draws the audience into its late-day warmth and glow – though it actually seems these gloriously shot moments are for the film’s more meandering and plodding moments, whereas the starkly clinical visual style of the scenes involving auctioneering conflicts are where the film thrills the most. It may sound mean, yet obvious to claim, but One Last Deal certainly isn’t coming close in artistry to the paintings it centres around. As evident from the skeletal story, starved off much needed conflict, this film struggles to aim for memorability as it stretches out such a small story to a feature length time. One Last Deal plays at UWA Somerville from Monday, December 10 to Sunday, December 16, 8pm, and at ECU Joondalup Pines from Tuesday, December 18 to Sunday, December 23, 8pm.